There’s a saying you can only ever have 2 out of 3 when you are looking for a contractor; you can have good, cheap, or quick, but never all three. 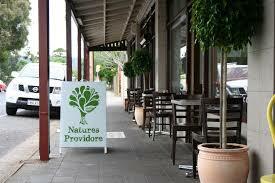 At Nature’s Providore – while the criteria is totally different, I think you get 4 out of 3 every time. I contest it’s what you should be looking for every time you make any purchase, every time you cast a vote with your wallet….……. As a sustainability practitioner, I have a problem with the above saying. While good is not negotiable, for me there is no such thing as cheap. What cheap means is that somewhere someone or something is being screwed by my choice – whether that’s exploited garment workers in Bangladesh not making the margins they deserve to provide for their family – or (more likely) something is being destroyed in our natural environment, too far away in distance and time for us to care. And since this is a write-up about my favourite-ever cafe, quick isn’t relevant either – I know the people at the former Doof Doof cafe are genuine, hard working and always have customers best interests in mind. I am not looking for the same turnaround time as a drive-through. In today’s harried world, a wee minute’s delay in my order is a rare gift. A complaint about a wait (to me) equals an over-active entitlement gland………..
At Nature’s Providore it’s all about the GOOD. My health, my happiness. Firstly the physical things. It’s in a local neighbourhood and by the looks has been a storefront since the lot was built on (which in Adelaide means many, many decades ago). The 70+ year old (?) barely renovated rooms are simple, calming. All that is necessary, only that which is useful. There is a sense, a feeling of integrity as the well-worn door handles and bench seats attest – it’s a place people meet and spend decent amounts of time together in relative quiet, compared to many other cafes in this city. That in itself while not terribly rare, sets the stage for more. The food and the juices are offered…….Not simply cooked or prepared. Glowing poached egg yolks are an almost weekly highlight of ours. I am thrilled to say my kids have come to love avocado & roast pumpkin seeds as a result of frequenting here (I could have never achieved that at home). Embarrassingly, I have whiled away many an hour there (writing job applications) and the nutty bliss balls and accompanying smiling characters have kept me upbeat! So statistically, if ever someone could have a bad experience it ought to be the regulars, but I’ve never heard a complaint from any of them. The range of organic produce always comes with a back story about a farmer close by, a character who I’m more than happy to support. This week the 3 kinds of potatoes, the fiesta of capsicums, the striped eggplant and newly plucked blackberries (yesterday) were brimming with goodness. I fill most of my weekly staples here – biodynamic milk with blobs of cream on top, local sourdough, Kangaroo Island eggs, Simon Bryant pulses. I have been healed by the Byron Bay superkraut. I don’t profess to know all of the brands and suppliers, but they have been researched, approved and guaranteed as the healthiest, most sustainable options by the ever-knowledgable Kate. I only know them by first name, but the proprietors are incredibly welcoming, should that be something you care for. And why wouldn’t you ? That’s a sustainable table. One where everyone is welcome and everyone is equally contributing along the supply chain. Nature’s Providore is all about putting yourself, your health and your eating pleasure first, but at the same time granting equal privilege and status to those who got the food to your plate. A place to be is one one thing, a lovely community within a bonus and seriously healthy offerings to consume begets even more joy. But the fourth piece, the crux for me? The patronage of what is worthy and the delivery of a desire for everyone to experience optimal health and optimal happiness. That includes the people at the start of the chain, the farmer, producer, baker, blender. It comes very naturally to this cafe. It underpins everything that they do. So grateful to these providers of natural goodness.